We all know the drill: remove all Confederate monuments from public property, put them in museums, no one will be offended and Americans of all races will unite in one big group hug. You do believe that, don’t you? So much for museums. . . Supporters of the Center (they are “sensitive” about calling it a museum) claim it will be educational and neutral. Prospects still look good, but the issue goes beyond Confederate monuments. This is about who writes our history and who shapes our self-perception as a people. Once the south, both historically and culturally, is marginalized, it will not take long before America’s history and heritage is diluted, if not rewritten. Is that possibility really a stretch? Remember when George Washington’s birthday was a federal holiday? Bet you had to think about that one. With enormous strides made in race relations in the last fifty years, leftists and civil rights hucksters have to look harder for controversies to divide the public. These statues have stood for decades and no one batted an eye, and now, like Pavlov’s dog, we jump at the word ‘offended,’ without question or debate, and erase all evidence of a cause and culture that many still cherish without upholding slavery or bigotry. The Civil War and its aftermath is complicated and full of different meaning for different people, but a sane society can grasp complexity and historical context. Whoever thought that watching The Dukes of Hazzard or owning a replica of the General Lee (with its Confederate flag on top) would constitute an offense to enlightened opinion? Furthermore, if you enjoy Gone With the Wind, you’re probably a racist. No one has said that yet, but (and we saw this coming), the Orpheum Theater in Memphis will no longer show the 1939 Oscar-winning classic. Space will not allow for a detailed analysis of GWTW, but the film lends itself well to multiple viewings because it is so rich in detail and nuance. The lead characters are flawed and complex, each trying to pull something good out of the ashes, still clinging to such concepts as grace and gallantry. Granted, the slave portrayals were considered controversial even in ’39, but once GWTW is banished from public favor, future generations will miss a classic performance: Hattie McDaniel, the first of her race to win an Academy Award, as the loyal but no non-sense Mammy who can spot a bull—— er a mile away. Clearly, GWTW (both the book and the film) should be studied and discussed, not erased from the cultural mainstream. The PC left, however, does not encourage independent thought, they simply bank on the masses’ instinct to react. The left does not envision one people united behind a common, flawed history. They see blocs of victims. They see the political and financial rewards of grievance politics, pitting one group against another. A sterile, non-challenging view of history, peopled only with one-dimensional saints and demons, as opposed to real human beings, appeals to just enough people (who vote) to be scary. That is what the left promises. The mob’s rage will not be mollified by the confines of a museum. 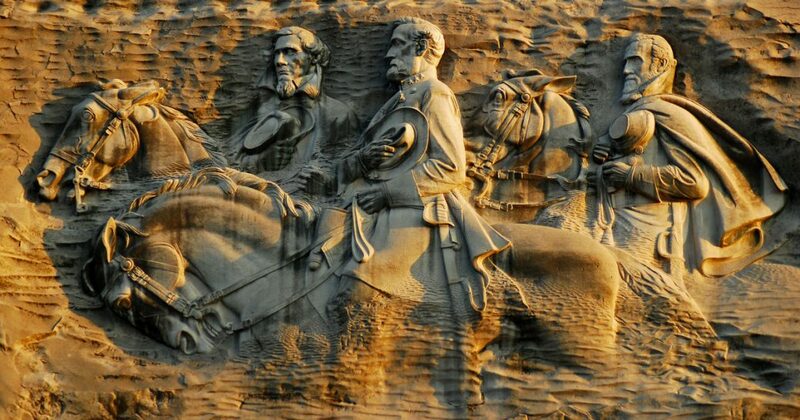 Relics of America’s complicated past, including the Confederacy, must be banished, not relocated. And, like a shark feeding on blood, there will always be something to be offended by, and if nothing presents itself, they will create it. Historical footnote: Just after Robert E. Lee (considered an honorable man, even by his enemies) surrendered, President Lincoln ordered that a band play ‘Dixie.’ That could surely never happen today as someone would surely be (gasp!) offended. As the PC left continues to pillage American history, the rational-minded must stay vigilant. The pertinent truth that can never be banished is that those who control history control the present. Indeed, where will it end?